Selecting for larger canola seed has production and profitability benefits. The extra value from larger canola seed is independent of sowing date. For a number of years growers have shown increasing interest in quantifying the potential benefits of seed sizing on canola production and profitability. As a response to this interest, a number of seed size treatments were included in replicated trials at Baker Seed Co, Rutherglen, to measure the benefits of grading grower-retained open-pollinated triazine-tolerant (TT) canola seed for size. The aim of this trial was to quantify the benefits of selecting larger canola seed from grower-retain stocks and determine the profitability of doing so. Trials were carried out during 2014 and 2015 as part of a larger seed treatment trial. The 2014 trial used Gem TT canola, sown on a single sowing date, while the 2015 trials used Bonito TT canola sown on two sowing dates. Both the Gen TT and Bonito TT canola had been grown at Rutherglen by Lilliput Ag. Seed was treated with Jockey® and Gaucho ® during 2014 trial, and Jockey® and Poncho Plus® during 2015. Seed was counted and sown to achieve the same target plant numbers (45plants/m₂). Results from the two years of trials are shown in Figure 1. The 2014 trial, sown on 30 April, showed a significant increase in yield of 200kg/ha at the largest seed size compared with both the small and medium-sized seed. The 2015 canola sown on 16 April did not show any significant differences, due to high variability within the trial. However, the medium and large seeded canola sown on 29 April yielded significant more than the small seed. The yield increase with large-size canola over the small-seeded canola was 310kg/ha. The results on vigour have also been consistent and remarkable in the trails, with visual differences evident (Figure 2). 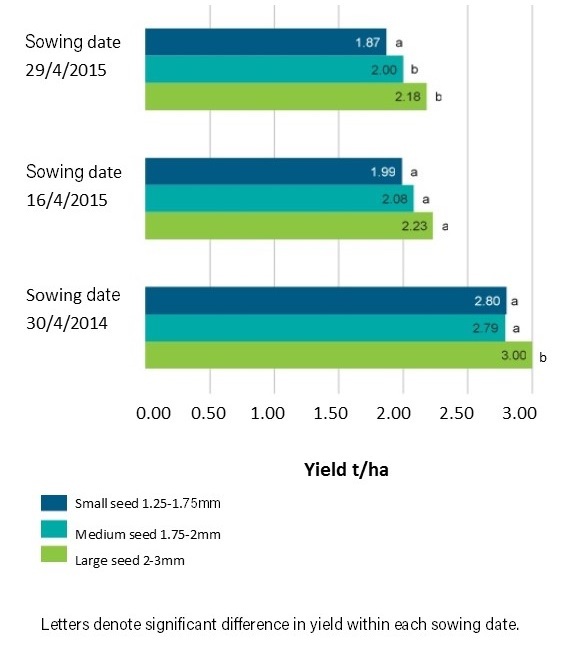 Figure 1 Effect of seed size on canola yield, when sown on 30 April 2014, 16 April 2015 and 29 April 2015. Table 1 Economic return from seed sizing and sowing of grower-retained open-pollinated TT varieties sown on 30 April 2014, and 16 and 29 April, 2015. There was also a correlation of yield improvement between each size grade, highlighted that the bigger seed the better the yield outcome. The exception to this was during the 2014 trial where the small seed tended to perform better slightly better than the medium sized seed. Commercial seed sizing and grading is available and easily achieved. Baker Seed Co continue to offer this professional service to growers. Contact Aaron on 0400 232 703 for further details.